When the world’s first skateboard film came out (1965's Skaterdater), skateboarding was still taking baby steps as a sidewalk version of surfing. But ever since 1984’s The Bones Brigade Video Show shifted the focus to innovative tricks, skateboarding evolved into an urban phenomenon, eagerly attacked by millions of riders across the globe. Along the way milestone skateboard films—and the filmmakers behind them—have defined the blueprint for modern skateboarding, with Public Domain, Video Days, and the Questionable video doing for skateboarding what Paid In Full and Illmatic did for hip-hop. But this month sees the release of what might be the most ambitious skate film to date: Mountain Dew Green Label Films’ WE ARE BLOOD, which stars (and was co-created by) Dew Team rider Paul Rodriguez, as well as many other members of the Dew skate team as they travel the globe, celebrating the universal bond created by skateboarding. 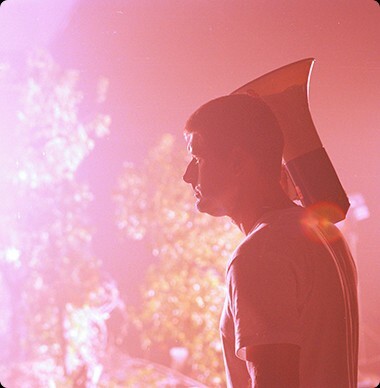 The only person to direct a progression-project of this magnitude would be Ty Evans, who has consistently broken new ground in skateboarding films through advanced camera technology and editing techniques. His marquee films include skateboarding classics Feedback, Modus Operandi, Yeah Right!, Fully Flared, and Pretty Sweet. WE ARE BLOOD is a long way from Ty's days aiming a clunky VHS camera at friends, as they skated the empty drainage ditches of his native Los Angeles in the 1980s. To celebrate WE ARE BLOOD, as well as this milestone in his career, Ty Evans took time out from editing to take us through the pioneering camera systems, technical breakthroughs, and milestone projects that defined his career, as well as the influential skate films and directors that inspired his journey along the way. You’ve been pushing the boundaries of skateboard filmmaking for some time now. When did you first get hooked? 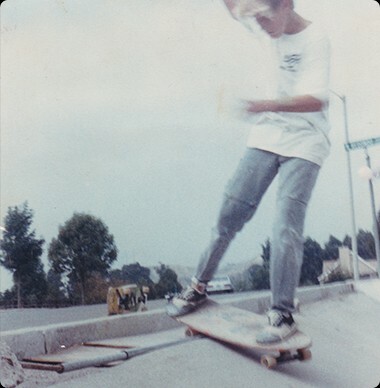 I started skateboarding in 1985. The act of skateboarding and skate videos almost went hand-in-hand—I was introduced to both right at the same time. There were drainage ditches in my neighborhood where all the kids would ride bikes and skateboards. Right around that time, I remember seeing my first skate film, Stacy Peralta’s Future Primitive. Up until that point, you had your own version as a kid of what skating is and what you and your friends are doing; watching Future Primitive was the first time I really saw what was going on in skateboarding. I instantly knew that I wanted to make my own videos. How long before you picked up a camera? As a kid, I always had an SLR camera, a Minolta. So I understood the concept of aperture, shutter speed, film ISO, and different lenses, at an early age. My high school offered a VHS film class, so I had the opportunity to get my hands on an early consumer-grade VHS camera to make skate videos with my friends. It was one of those big cameras with a cable attached to a separate deck holding the VHS tape. I wanted to ride on a board while I filmed skateboarding, so I had to have a friend ride on another board holding the deck connected to the camera, because it was so huge [laughs]. Were you already envisioning a future making skate films? As a kid it was a slow process. I was always into filmmaking but didn’t have constant access to cameras. But growing up in California, I was always around the film aspect. I remember seeing Stacy Peralta there filming the Powell team, Spike Jonze shooting photos of the World guys, or the Plan B team filming with Mike Ternasky, Jake Rosenberg and Dave Schlossbach. That made it almost seem attainable. So I told myself, If these guys are doing it, maybe I can do it—so let’s try it! I really wish I went to film school, and I tell all the kids to go because it can give you a really great base in filmmaking. At the same time, you can go figure it out yourself. That’s how a lot of people have done it, myself included. It’s a lot harder, though, because you don’t know what you’re doing. Were the directors you mentioned an inspiration to you? Immensely. There are so many people in skateboard filmmaking who paved the way for me to be doing what I’m doing now. Guys like Stacy Peralta, Spike Jonze, Jake Rosenberg, Mike Ternasky—all those guys really laid the groundwork. I owe those guys. I’m not sure if they realize how important what they did was to my life, but I would hope that I would be able to pass that on to other kids in skateboarding. If I can inspire other kids to do the same thing, that would be the greatest thing in the world. What was the defining moment, where you knew you wanted to pursue this seriously? The first skate video premiere I went to was for the second Plan B video, Virtual Reality, in 1993, in La Jolla. It was the most mindblowing experience of my life! Sitting there in the theater with all the world’s best skateboarders, watching ground-breaking skateboarding on a screen with everyone, and feeling that excitement of seeing these tricks for the very first time. The way they were presented with music and editing, that was something that resonated with me. I was like, “I’m gonna do this, now!” From that moment on, I really set out to pursue making skate films. How did your dream become a reality? When did you start to develop your own style? The next film I did was called Genesis, for Planet Earth’s sister company, Rhythm. That video brought something different to the table, with crazy electronic music and great visual effects done by Jose Gomez. “Genesis” means the birth, the starting of something; that’s where I look back at myself and see where I really started finding my own voice in what I wanted to do in skate films. With Genesis I really started going out on a limb and trying to bring something different to the table. You can see elements of Genesis in all the films I made through the years. You started working full-time for Girl in 2000, heading their video department. Was that a dream come true? I had looked up to [skate filmmaker] Aaron Meza and [Girl co-founder] Spike Jonze for years. In my eyes, Girl was the best! There was always Plan B, but once Plan B dissolved, I felt that Girl always carried on the legacy that Plan B had started. The Girl films had the world’s most amazing skateboarding but it also had some of the really cool smart filmmaking ideas that Spike and Rick [Howard] brought to the table. I will be forever grateful for working at Girl: it was the best experience of my life. The “invisible boards” we shot for Yeah Right! were a huge learning experience, and something that Spike brought to the table. I had never remotely been on a shoot of this magnitude; it was really the first time I worked with Spike and wrapped my head around a huge film set environment. The explosions in Fully Flared’s intro were something Spike, Rick, and I had always been talking about. It was crazy. To this day, it’s one of the most amazing intros to a skateboard film. The guys could have died. Mike Mo doing that switch flip… if [SFX co-ordinator] Marty [Bresin] would have pulled the trigger on that explosion one second earlier, Mike Mo would not be here with us today. You’ve also worked in the commercial world. I was initially just a skateboard filmmaker, and when I was hired by Girl, Spike opened up this whole world of higher-end filmmaking that he is used to. 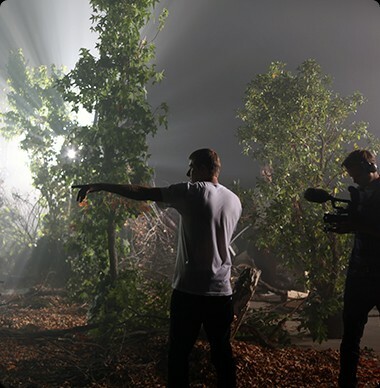 Then I actually signed up with a commercial production company and started directing commercials. The biggest one was a Chevy commercial that aired during the 2012 Super Bowl. As soon as the commercial aired on the TV, my phone had 50 text messages. It’s all come full-circle because everything I learned about filmmaking on these commercial jobs I can bring back into the skateboarding world. “When we started working on Yeah Right!, in 2000, it was such a huge task. There were so many riders on the Girl and Chocolate teams. I was finally able to put out Yeah Right! after three years. And the access you have to all the equipment since you joined Brain Farm in 2013 must be like being a kid in a candy store. It was an opportunity I couldn’t pass up. I had seen this film, That’s It, That’s All, by Curt Morgan, a snowboard film that utilized some cool equipment using the Cineflex camera system, on helicopters. Curt started Brain Farm and we became buddies and started talking about how it would be amazing to make a skate film on the level of That’s It, That’s All. So after finishing Pretty Sweet, I joined Brain Farm and started making the most ambitious skate film I’ve ever embarked on in my life: WE ARE BLOOD. In terms of using the new technology, you also have to be careful what you wish for. I suddenly went from using all these consumer-grade cameras to top of the line, as top as it gets: RED, MoVi, Arri Alexa, Shotover F1, Phantom 4K cameras, the Cineflex system... All these camera systems were just groundbreaking. It took me a full year to wrap my head around these cameras and also how to use them for skateboarding in a fast and efficient manner. WE ARE BLOOD is going to be huge. What was it like working on something of this scale? Curt and I were already talking about WE ARE BLOOD in 2010. But in order to make a film of this scale, we needed the right partner to come on and back it financially. And that’s where Mountain Dew’s Green Label Films came on board and actually made this film a reality. So in April of 2014, we did the first trip to China, and it was game on. We did a US trip; we went to Barcelona, Dubai, and Brazil. It’s been an amazing experience, and I have been so fortunate to work with all these amazing skateboarders and Paul Rodriguez as the backbone of the film. At the end of the day, we are filming the best skateboarding and travelling around the world and having a great time. Regardless of the camera systems we are using, it’s still the same thing we have always set out to do.